Finding the best cordless hedge trimmer can be difficult. This post explores some of the best on the market and brings you a buyers guide. Our favorite cordless hedge trimmer was the LACK+DECKER LHT2436 and to find out why keep reading! Finding a great cordless hedge trimmer isn’t simple. In this section of the post we’ve reviewed some of the top models on the market to help you understand what separates the great models from the poor quality ones. 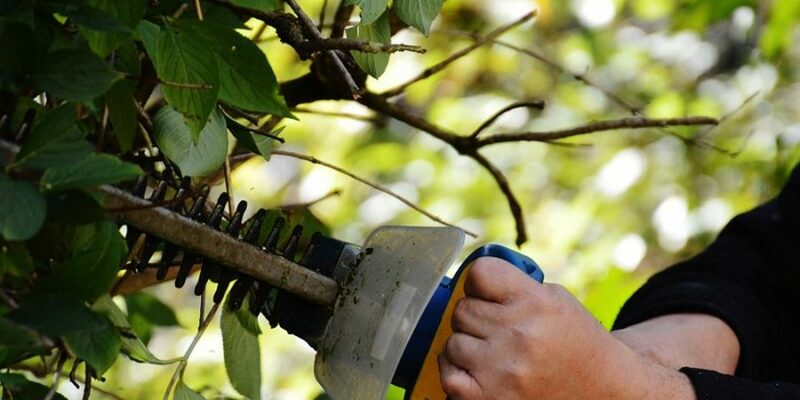 Below we’ve listed 6 of the best cordless hedge trimmers which you’ll be sure to love. The dual-action blades can cut branches up to ¾ of an inch thick and has a comfortable grip handle that helps this trimmer to stay firmly in your hand for precision cutting. A great feature of this Black + Decker high-performance trimmer is the fast charge capability that fully recharges the battery within an hour so that you can complete your large landscaping projects in a timely fashion. This trimmer is specially designed to handle tough jobs and large landscapes with less stalling and easy handling during operation. The Black + Decker 40V Max comes equipped with impressive 22-inch dual-action blades for precision cutting, reduced vibration, and added comfort while trimming. The sturdy blades can cut hedges and branches up to ¾ inches thick which comes in handy for most standard landscaping projects. The Black + Decker 40V max introduces a full-length trigger and a soft grip for ease of use with this model This trimmer combines a comfortable design with ease of use while managing your landscape. The wraparound auxiliary handle provides additional maneuverability and can be used both vertically and horizontally to accommodate any angle. This state of the art trimmer comes equipped with a 40-Volt Max Lithium-Ion battery. The trimmer has a built-in battery charging indicator that tells you when your trimmer needs of a charge at a glance. This feature is great for long projects that may require more than one charge during the course of your project. The Worx WG Powershare is another lightweight cordless hedge trimmer that is designed to pack a powerful landscaping punch. The Powershare combines cordless operation with portability and comes with a D-grip front handle that makes cutting hedges and branches easy from any angle. The Powershare features 20-inch dual-action blades that deliver high-performance cutting with minimal vibration. This trimmer can cut up to 9/16 in diameter which is an ideal circumference for trimming for thick branches and twigs. The PowerShare is ideal for use in small to medium sized trimming projects. Weighing in at just six pounds, this ergonomically designed trimmer combines cutting power with ease of use for an all around enjoyable trimming experience. Another great feature of this trimmer is the 20 Volt Powershare battery is that the included battery is interchangeable with similar landscaping power tools within the Worx family. If you’re already a Worx fan this is definitely a plus! This eye-catching lime green cordless hedge trimmer features 20-inchsteel dual-action blades designed for optimal trimming performance. This trimmer boasts a shaft extension that allows for trimming of bushes and hedges without the addition of multiple tools. This Greenworks trimmer comes fully installed with a 3-position adjustable trimming head. Great for trimming at various lengths and hard to reach angles. The Greenworks trimmer has a 40 Volt Lithium-Ion battery that is interchangeable with similar G-Max powered tools. One of the GreenWorks best features is its extended reach capabilities which are not always found with such an affordable hedge trimmer. The extended reach feature makes reaching taller hedges and branches a breeze and improves the look of your landscape by tackling hard to reach whispy branches. The GreenWorks feature packed trimmer combines the best in affordability, design, and ease of use for do-it-yourself landscaping for hard to reach areas. The Ryobi One+ trimmer features 18-inch dual-actions blades and a wrap-around handle for comfort and reduced vibration during use. This trimmer comes packed without an 18-volt battery but can accommodate any other Ryobi One+ battery that you already own or any other compatible lithium-Ion or Ni-Cad battery. This trimmer is relatively light-weight and easy to handle weighing in at only 5 pounds. Though lightweight in construction, this trimmer is designed to deliver low vibration, through cuts and clean cut hedges for quick landscaping projects. The only major downside of this affordable lightweight trimmer is that it doesn’t come with an included battery. You’ll need to provide your own battery to use this power-packed lightweight trimmer. What it lacks in the battery department, the Ryobi One+ makes up for in affordability, ease of use, and compatibility with similar landscaping power tools and related products. Last, but certainly not least on our list of the best cordless hedge trimmer reviews is the convertible Sun Joe grass shearer and hedge trimmer. The Sun Joe Lithium-Ion Cordless Grass Shear Hedge Trimmer combines the best of both worlds in a convertible trimmer. This trimmer can be converted from a grass shearer to a hedger in no time. It packs a double punch! Complete small landscaping projects quickly with this two-in-one more convertible shearer and edger. The Sun Joe trimmer is designed for landscaping small lawns and gardens. Especially hard to reach landscaped areas that your mower simply can’t reach. This trimmer is one of the lightest weight convertible designs available at an affordable price and weighs in at an astonishingly light 2.5 pounds. The Sun Joe boasts an especially long battery life, powered by the rechargeable 7.2 Volt Lithium-Ion battery that allows for flawless cord-free operation. This is an ideal trimmer for tackling small landscaping and gardening projects quickly with a pristine result. The Sun Joe is ultra portable making hard to reach areas and straggly looking landscapes a thing of the past. Now that we’ve reviewed some of the best hedge trimmers, its time for our buyer’s guide. This section will get you ready to make your next cordless hedge trimmer purchase when the time is right. One of the most important factors in preparing to purchase your new cordless trimmer is your landscape. Survey your landscape to get an overview of what your new trimmer will be up against. Consider the amount of grass shearing, trimming, and hedging that need to be done and take these into account when making your purchase. Be sure that you are choosing the best trimmer for your individual landscape needs. Lightweight trimmers designed for small hedging projects would be a bad choice. For a large trimming project with tall hedges and thick branches. Have you ever been in the middle of an important landscaping project and run out of battery? If so then you already know why good battery life is a critically important facet of landscaping. Unlike corded electric trimmers you will be reliant on battery life to get the job done. Save yourself a headache by choosing a trimmer with a rechargeable battery that requires the least amount of charging during the course of your projects. When choosing your next hedge trimmer consider the amount of time that you will spend landscaping. Consider this for your whole yard in minutes and hours. Take your yard size into account when checking the battery capacity of your new trimmer. While longer life is generally considered to be a better buy, if you have a smaller yard, longer battery life may be less important than flexibility for you. Lithium-Ion Battery – A rechargeable battery that comes in varying voltages. These are often packaged with cordless trimmers, hedgers and similar equipment. Ni-Cad Battery – Another rechargeable battery powered by a combination of Nickel and Cadmium. Typically packed with cordless, trimmers, hedgers, and other powered landscaping equipment. Extender – An adjustable add-on tool that extends the range and reach of your cordless trimmer and hedger to reach a harder to reach or out of the way areas for a more polished look and to provide added safety when trying to reach out of the way areas. Convertible – A term used to describe trimming and hedging tools that have more than one built-in capabilities. Such as grass shearing and hedging as mentioned in one of the reviews above. Interchangeable – A term that generally refers to Lithium-Ion and Ni-Cad batteries that are able to be used with more than one tool in addition to the original power tool that they are packaged with. Ease of Use – Choose an easy to use trimmer for do-it-yourself projects to avoid complications. Battery Life – Choose a trimmer that has the right battery life for the size of your project. Calculate the estimated total project time and choose a trimmer that has a battery with the capacity to support completing the project with the least amount of recharging required. So, you’ve now read reviews on the best cordless hedge trimmers that this year has to offer. you should feel more empowered to make an informed buying decision when choosing your next cordless hedge trimmer. You should be able to distinguish the difference between single-function and convertible trimmers and identify the best cordless hedge trimmer that will meet your unique landscaping needs. Measure the landscape and determine the amount of work that needs to be done. Consider the amount of time that your landscaping project will take. Take this account when assessing the battery life needed to complete your next project. For smaller landscaping projects or projects with harder to reach areas, consider a lightweight convertible trimmer. One that will provide you with multiple functions such as grass shearing and hedging in one to complete your landscaping project to your satisfaction. For more information on buying cordless hedge trimmers check this post out.